Bearers of the Cleansing Fire is my third idea for my Company of Iron. This band is built around models with continuous fire ability. While the models are slow and number of attacks is pretty low, it can be boosted during the game due to vengeance which works pretty fine for models with multiple boxes. Fire effect is also pretty useful as burning models has to take extra damage in their maintenance phase unless the effect is shaken or the fire goes out. I really dig the theme on this one. Click photo to enlarge. 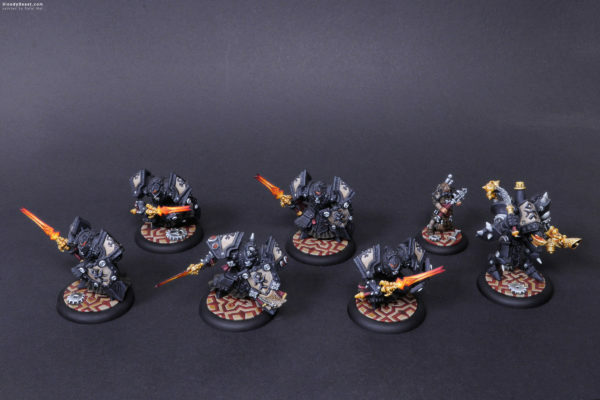 Posted in Warmachine & Hordes, Protectorate of Menoth, Company of Iron and tagged Painted, Privateer Press.